The pop up snowflake promotional idea got its name because we initially printed a snowflake on it for a Christmas pop up promotion! 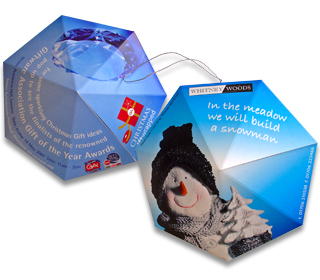 To increase the seasonal appeal of this pop up product, we often add a silver or gold loop to the pop up snowflake to enhance its appearance as a promotional Christmas product. The Pop Up Snowflake is one of the pop up gems range along with the Pop Up Diamond, Pop Up Hexapop and Pop Up Johnson 13. Using pop up gems as Christmas promotional ideas and alternative festive greetings is very popular however clients have come up with some other fabulous creative marketing ideas for these business communication products. A pop-up gemstone shape such as the Pop Up Snowflake and Pop Up Hexapop adds a flair and quality feel to any marketing campaign. They have often been portrayed as jewels and gemstones; for example: a pop-up diamond, a pop-up sapphire and a pop up emerald. A bit of lateral thinking was applied by the designer who came up with the creative marketing idea of making it into a pop up flying saucer! This promotional pop-up product is correctly described as a hexagonal bipyramid but we have decided that the name Hexapop will suffice for now! The Hexapop falls into the same category as similar products – the Pop up Snowflake and the pop up Johnson 13 – inasmuch as they can be printed to look like precious stones or jewels or, at Christmas time, they can be made to look like seasonal decorations. 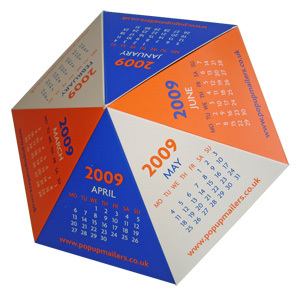 However, the hexagonal Pop Up Hexapop has 12 triangular faces which makes it ideal as a promotional desk calendar with one date per triangle and six months per side. The hexagonal pop up 'Hexapop' is perfect as a promotional desk top calendar; however it does lend itself to many other design ideas too. 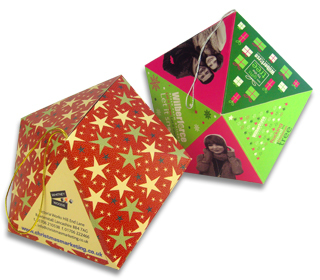 This shape along with the Pop Up Diamond, Pop Up Snowflake and Pop Up Johnson 13 could be ideal for any company with a triangular or hexagonal logo and the very fact that the Hexapop promotional pop up is made up of triangles means that it lends itself to being printed to represent anything with triangular sections. These products have successfully represented a bicycle wheel with spokes, a slice of pie, a piece of cake and a pizza with triangular slices. Add-ons and novelty items should be considered to add humour or extra definition to your Pop Up Snowflake or Pop Up Hexapop. For example, adding a pair of Jiggle eyes can transform the Pop Up Hexapop into a monster; some cuts along the joining edges create teeth and adding a loop of decorative string transforms the product into a promotional Christmas tree decoration. We added teeth to the Pop Up Hexapop making it into a pop-up fish and we called it a snapper. It has been a very successful direct mail idea and pop up promotional product for business communications. 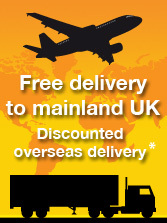 Here are a few more suggestions for marketing ideas for this popular pop up mailer: jewellery; pendant; charm; stone; ruby; jewellers; shatterproof; crystal; glass; icy; frozen; crystallize; toughen; diamond jubilee; special day; engagement; wedding; anniversary; cheese spread; slice of cake; piece of cake; flying saucer; space craft; umbrella, golf brolly or parasol – all perfect for the Hexapop shape.